They access the surprisingly wide sources of maritime songs of all kinds, both by finding obscure recordings and also studying live performances by professionals. They research the origins of, and the meanings behind, the words, rhythms and social history of the songs and then try to reproduce them in realistic and authentic performances. Recent and forthcoming gigs include regular appearances at local folk clubs and return visits to both the annual Filey Folk Festival and the Whitby Seafest. They were asked by Fley Lions to help celebrate it 50th anniversary, and to entertain at the Filey RNLI weekend. Although their motto is jokingly “never knowingly over-rehearsed” they do actually have regular weekly practices. No microphones, no amplification, no music stands, but a traditional tot of rum to start (just to help the vocal chords, of course), means that they can perform anywhere, without any fuss. The Ramshackles’ enthusiasm is infectious and soon wins over even the most initially cautious audience. 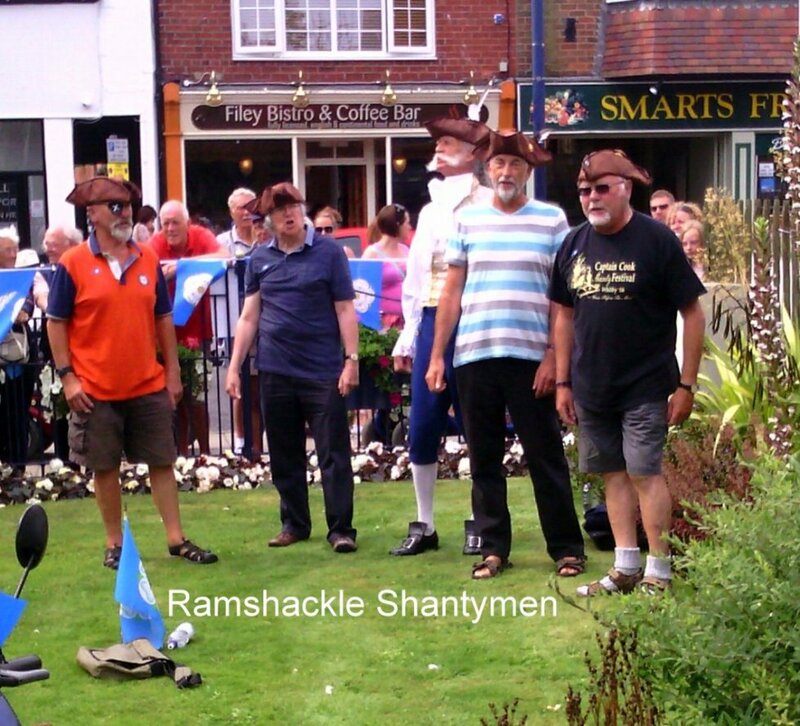 In addition to their regular appearances at Filey Folk Club, and other similar venues, the Ramshackles are now being approached to perform to wider audiences. They were invited by Richard Grainger to participate in his "folk opera" in Whitby on 1st November wich filled St Hilda's Church to overflowing. They now appear on the "Stormbound" CD which was on sale at the performance. The Imperial Music Bar in Filey hosted a John Peel Day on 15th November and the guys were asked to do the opening spot at the event. They will also be joining Monkeys Fist, a well-established shanty group, at Robin Hoods Bay next year and have also been snapped up for a return appearance at the Filey Lifeboat weekend next August. Busy men, but at least it keeps them off the streets - ah well actually it doesn't because they are also becoming very experienced in working the crowds busking in Malton, Filey and Whitby. The Ramshackle Shantymen is a good example of how, by learning a new skill through the U3A, you can put a bit of fun into your life and enable you to share it with others. If you are interested in this group then please use the link below to contact the shantymen leader who will contact you ASAP. Family History Friday Walking Handicrafts Homes, Gardens, Museums.